November 30, 2018 – Credit Valley Conservation (CVC) is hosting a virtual public open house for the Fletchers Creek Sustainable Action Plan (SNAP). Residents, businesses, schools and community groups in Brampton’s Fletchers Creek neighbourhood are invited to review the Draft Action Plan and provide their feedback. The feedback collected will help improve the final Action Plan and will be shared with Brampton City Council in 2019. The virtual public open house is available at cvc.ca/fcsnap until December 13. Check to see if you live, work or play in the Fletchers Creek neighbourhood at: https://cvc.ca/your-land-water/fletchers-creek-snap/snap-study-area/. 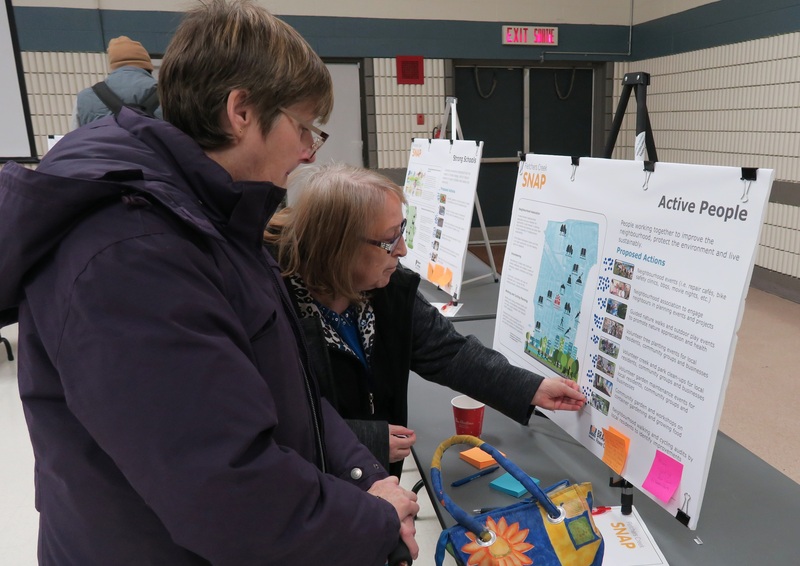 On November 21, local residents participated in a Public Open House at Chris Gibson Recreation Centre in the heart of Fletchers Creek SNAP neighbourhoods. Participants voted on their preferred actions and provided their feedback to CVC’s SNAP team. The Fletchers Creek neighbourhood is located in central west Brampton within the Credit River Watershed. This mature neighbourhood, home to approximately 8,800 residents and numerous businesses, is the setting for a Sustainable Neighbourhood Action Plan. SNAP is a plan for climate action and urban renewal that will help the neighbourhood become more environmentally sustainable and resilient to the impacts of climate change. Fletchers Creek SNAP is being led by Credit Valley Conservation, City of Brampton and Region of Peel. For more information contact Karen Bannister, Senior Program Coordinator, Sustainable Neighbourhoods, at 905-670-1615 ext. 510 or karen.bannister@cvc.ca.